A DIY painter’s worst nightmare is spending all day painting only to see the mess they created in the end. Trust us when we say that prep work will save you from pulling your hair out when the project is all said and done. First and foremost, cover the floors and furniture with cloths to avoid drips and splatters. Next, wrap door knobs with plastic and tape around the edges of the trim. Lastly, remove any outlet and switch covers. Whether this is the first time painting your house or the tenth, painter’s tape is an absolute must. What makes painter’s tape so helpful is that it ensures clean edges and a polished finish. Just remember to seal it tightly around any baseboards and windows to prevent bleeding. One final tip when using painter’s tape: Remove it before the paint dries completely. See for yourself what makes this product a DIY painter’s best friend. This one can be a major inconvenience for painters. Let’s say you’ve just finished painting another room and you’re on to the last one. Then you look down at the paint can and it hits you — you don’t have enough paint to finish. Rather than risk actually being in this situation and having to head back to the store for more paint, take proper measurements right from the start. Keep in mind that it’s always better to have a little extra paint than being stuck with not enough. You consider yourself a perfectionist. When it comes to home improvement projects, you might take a little more time double-checking that everything is done correctly the first time. With that in mind, perhaps you’re thinking about using a brush for the entire house. Don’t make this mistake! Unless you want to turn this endeavor into a never-ending project, we recommend also using a roller whenever possible. Does your painting project include the exterior of your house? Then it’s imperative to check the humidity levels before you get started. Especially in New Jersey, humidity can slow down the drying time for some water-based paints. Again, why force yourself to paint your house twice because of a silly mistake? Do yourself a favor and wait for a less humid day. This is another no-no for DIY painters. Sure, it might be tempting to buy the cheapest paint you can find. What many inexperienced painters don’t realize, though, is that not all paints are the same. Should you go the DIY route, opt for the industry’s top brands such as Benjamin Moore, Sherwin-Williams, and BEHR, among others. We endorse these products because they’re the same ones we use here at DJ’s Painting! This might be the most common painting mistake among homeowners. It’s almost as if these people think they can skip an important step of the process and still end up with beautiful, long-lasting results. But that couldn’t be further from the truth! Primer provides a good surface for the paint to adhere and it helps to bring out the color you chose. By investing in a quality primer now, you’re setting yourself up for success down the road with your paint project. As you can see, there’s a lot that can go wrong during a DIY house painting project. Especially if you don’t have much in the way of free time, we recommend hiring a professional painter instead. DJ’s Painting has been New Jersey’s preferred painting company for more than three decades. Whether you want to add a fresh coat of paint to one room or your entire residence, you can count on DJ’s for top-notch results. 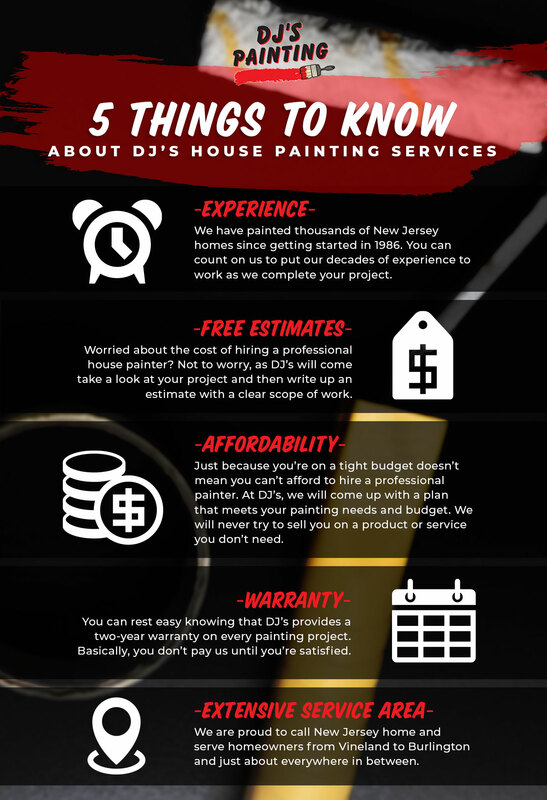 Spring is the perfect time of year to take advantage of DJ’s painting services! You’ll be amazed at how a freshly painted space can transform the look and feel of your house. So get ahead of the season and contact DJ’s Painting today.